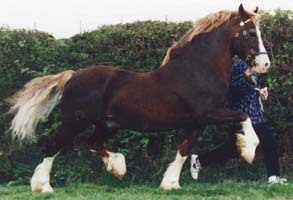 Nebo has been used as a prefix for registered Welsh Ponies and Cob since as far back as 1918. The stud as it is known today was formed when Mary and Geraint got married in 1961. 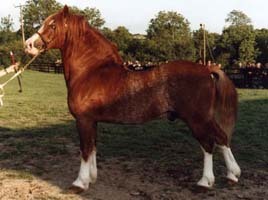 The foundation mare was a wedding present, the brood mare Tyngwndwn Mathrafal Lady. Tyngwndwn was the prefix of Geraint prior to their marriage. This by today is used by their daughter Lisa and her husband, while Owen their son shares the prefix Nebo. This valuable brood mare became a real asset to the stud. 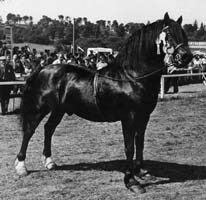 She was the dam of Nebo Black Magic, a stallion known worldwide and very seldom does his line of breeding not appear in the extended pedigrees of most of today's cobs. Amongst others this mare also produced Nebo Princess Ann, the dam of many champions including Nebo Daniel. The breeding pattern has been kept on the same lines since the beginning of Nebo. Temperament, type and action being the key factors in the breeding pattern. Please click on the names or pictures below to read about some of Nebo's most famous and most loved horses.